One of the benefits of a 360 camera is that the camera and the selfie stick can appear invisible, making the 360 camera appear to float in mid-air. But this works only if you know how to do it. Here are 3 steps to making your 360 camera and selfie stick invisible. A 360 camera sees everything except the area between its lenses. If you hold it with your hand or with a mini handle / mini tripod, your hands will show up prominently in the photo or video, which will make the camera’s presence obvious to your viewers. Instead, the first step to making your 360 camera and selfie stick appear invisible is to get a selfie stick or monopod that is narrow enough to fit between the lenses of your 360 camera. With thinner 360 cameras, you’ll need thinner selfie sticks (which can also work with thicker 360 cameras). The one I use 90% of the time is the Benro MK10 (available here), a selfie stick tripod. When you remove the ball head, it is thin enough to fit between the lens of even the slimmest 360 cameras such as the Ricoh Theta, the Xiaomi Mijia Mi Sphere and Madventure 360. Here is a tutorial for removing the ballhead. To keep the selfie stick invisible, you must always keep it inline with the camera. 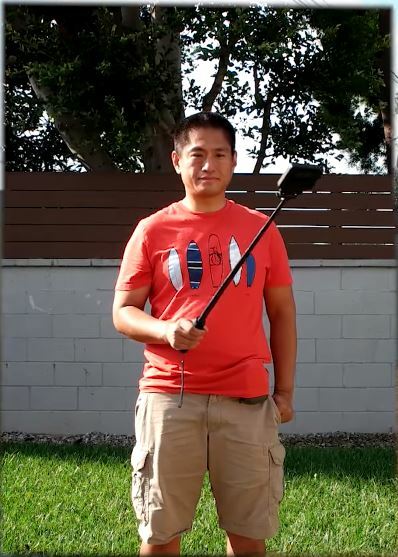 Do not angle the camera toward the selfie stick or else the selfie stick will show up in the 360 photo or video. With a conventional camera, you need to point the camera toward your subject. In contrast, a 360 camera captures everything around it, so you don’t have to point the camera at your subject. In fact, if your 360 camera is stabilized, such as the Insta360 ONE, or Xiaomi Mi Sphere or Rylo, the camera can be tilted at any angle and the photo or video will still appear to be level and vertical. In other words, rather than pointing the 360 camera like a conventional camera, use it like a microphone (i.e., it can be tilted at any angle) and bring it near your subject. Tip: A good distance for people is around speaking distance, and a good height is around chin level. How does this help with invisibility? Most people aren’t familiar with 360 cameras, therefore they will expect the 360 camera to be supported directly below it. When they look down and see nothing, it contributes to the illusion of invisibility. 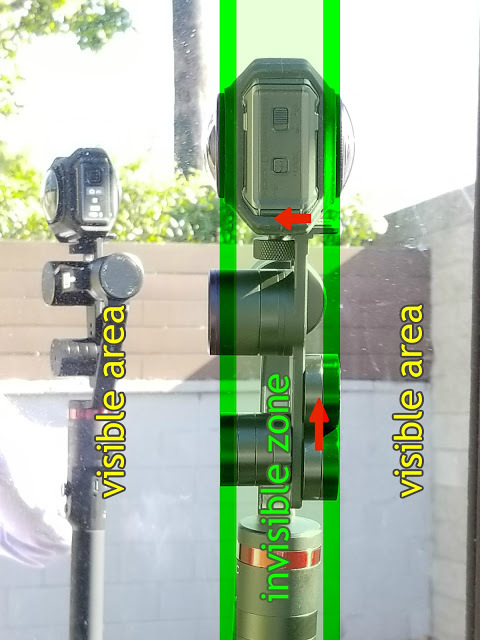 On the other hand, if your 360 camera does not have built-in stabilization, then the same principle applies (bring it near your subject) but you must keep the camera vertical. Alternatively, you can freely tilt the 360 camera and level the horizon during postprocessing with video stabilization software, or 360 photo editing tools. One of the most important rules of shooting with a 360 camera — perhaps more important than making the selfie stick invisible — is to avoid the stitch line. Avoid placing anything important within the stitch line, close to the camera. Anything that is both within the stitch line and close to the camera will appear split up. When you’re shooting, I like to imagine that the 360 camera is a giant fan. 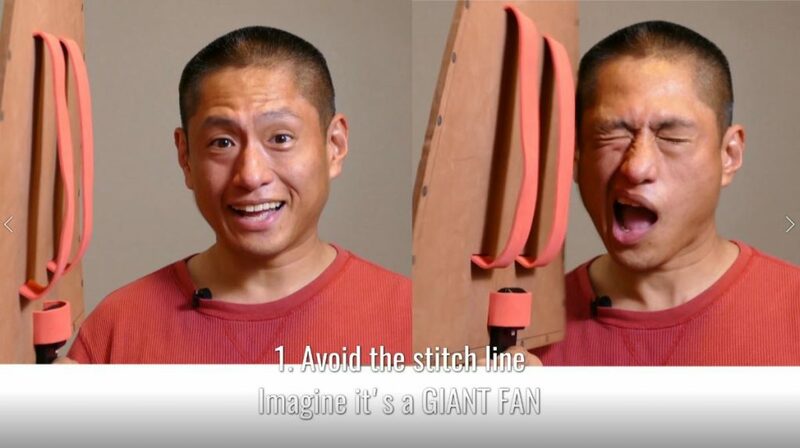 If the fan will hit you or someone else, they will be within the stitch line. Adjust the angle of the 360 camera so that nothing important will be hit by the imaginary fan. This will make sure that nothing important is within the stitch line. Note: the size of the giant fan depends on the distance between the lenses and how smart the stitching is. For cameras such as the Ricoh Theta with a small distance between the lenses and smart (optical-flow) stitching, the giant fan will be around 1 foot in radius. For thicker 360 cameras that have simple (template-based) stitching such as the Kodak SP360 4K Dual Pro or even the Garmin Virb 360, the radius of the giant fan can be more than 5 feet! Test your knowledge: solve the mystery! 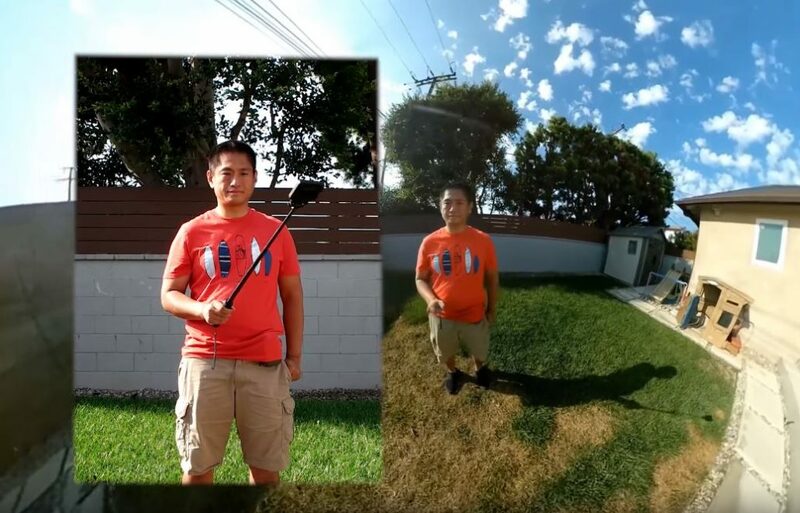 Now that you know how to make a 360 camera and selfie stick invisible, can you figure out where I put the camera and selfie stick in this 360 video? You can check if you guessed it right: here’s how I did it. If you have any questions, please let me know in the comments. Now go out and take some photos and videos with your invisible 360 camera and please share this post!